Back when my group in Utah was playing The Dresden Files RPG, I wanted to try something different than my usual beads or stones for Fate points. I initially considered the official Fate coins: They’re lovely, but also not cheap, and like beads/stones they’re all the same. And then I thought, why not just use actual coins? But not the same coin; not a roll of pennies, economical as that solution would be. A few eBay searches later, I figured out that I didn’t want any tokens and that I did want circulated currency (more character). 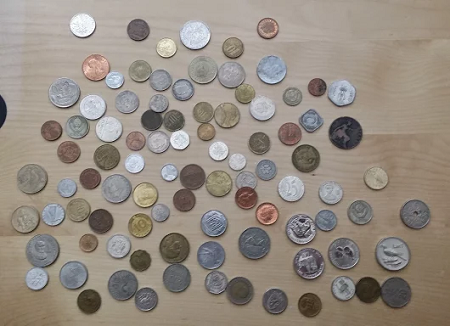 For about $18 shipped, I bought a pound of “world coins,” about a hundred coins with just a couple duplicates. They worked great in play. We always had more than enough of them at the table, and the purse I kept them any took up hardly any space at all. While that campaign has ended, my coin purse sits on my shelf of game aids, ready to serve in some other game.